Can robots and AI be used to inspire healthy change in humans? In the interest of cancer prevention, the creators of hitchBOT have paired the smarts of IBM’s Watson with Pepper, the most personable robot you’ll ever meet. Centre. Photo by Ian Patterson. Doctors in Canada diagnose more than 8,000 cases of skin cancer each year, most of them preventable. Since we still aren’t taking doctors’ orders to slather on sunscreen, a multidisciplinary research team from McMaster and Ryerson universities is exploring what happens when we replace the messenger – with a cute little robot. The team, led by communications researchers Frauke Zeller and David Harris Smith, and dermatologist Hermenio Lima, is exploring how to effectively combine best practices from medicine, psychology and communication studies with state-of-the-art technology to help people adopt healthier behaviours – in this case, wearing sunscreen. (Rounding out the lineup is psychology and neuroscience researcher Sue Becker, computer engineering postdoc Naby Nikookaran, and eight student research assistants.) The technology they’re using combines IBM’s Watson – a powerful artificial-intelligence and natural-language processing program that made a splash back in 2011 with a winning streak on Jeopardy! – with an autonomous, interactive robot named Pepper. “We want to leverage the effect robots have on humans,” says Dr. Zeller, who has studied human-robot interaction through the lenses of linguistics, philology and communications theory for nearly two decades and now works as a professor with Ryerson’s faculty of communication and design. She notes that people generally find a “friendly” looking robot immediately intriguing, and robots don’t get much friendlier than Pepper. 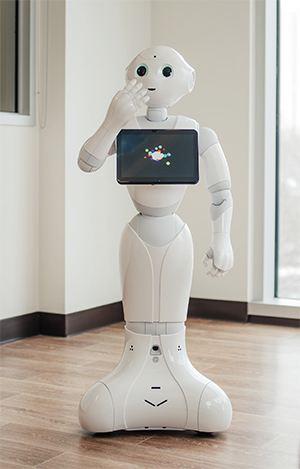 Designed by SoftBank as a “social robot,” Pepper stands four feet tall, moves fluidly and spontaneously, and has striking kewpie eyes that light up and track movement. “When people meet Pepper they almost instantly fall in love with it,” Dr. Zeller says. Frauke Zeller with students Haley Coppins, Alexa Pavliuc, Marisa Samek and Hana Smith. Photo by Alia Youssef. That’s why the team is investing so much time in designing, writing scripts for, and user-testing Pepper personalities. One, “Brain Pepper,” is a teacher. The other, “Fun Pepper,” is designed as more of a friend. Between the two, they’re assessing preference for what Pepper says and how the robot says it – everything from tone and gesture to how far away it should stand. If anyone is up to the task of creating a robot that people want to talk to it’s Drs. Zeller and Harris Smith. The last robot they developed, a scrappy-looking robot named hitchBOT, became headline news as it hitchhiked its way across Canada in 2014, before finding a home in Canada’s Science and Technology Museum in Ottawa. Dr. Harris Smith adds that they’ll be trying to replicate and maintain a similar kind of virtual presence for their Pepper. This time, though, the plan is to develop a 3D version of the robot for an app that patients can use to keep in touch with Pepper while keeping up a healthy skin-care routine. The app, he says, replaces the face-to-face coaching and support that psychological research shows can help a person achieve a goal, or a change in habit. Both the app and the robot are intended to complement the work of health professionals. “The aim is not, and will never be, to replace any humans – be it nurses, doctors or whoever. It’s really to add or to harvest what we have in terms of robotics and AI processes to understand … how can robots help humans to become better,” Dr. Zeller says. 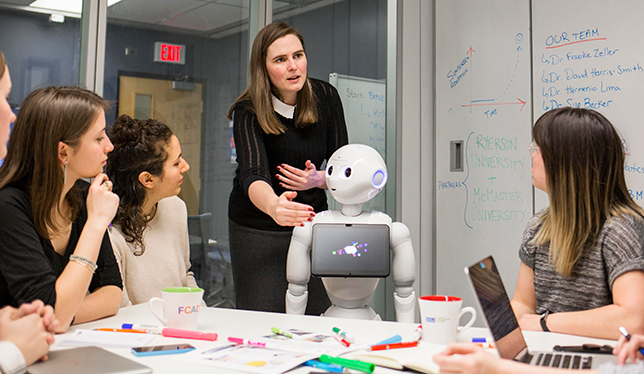 If all goes well in the current design and user-testing stage, the team hopes to have a Watson-powered Pepper prototype this summer, with plans to roll the robot out in a medical setting sometime soon.